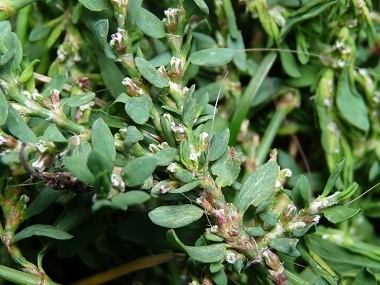 Common knotgrass is a low-growing, weedy grass that is hardy. The stems have nodes and when closely examined, they have attractive flowers. 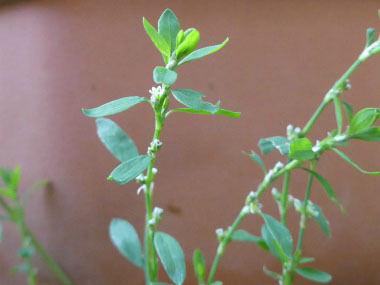 Many people consider this a nuisance weed as it tends to like the side of driveways and through the cracks of patio stones, but the Polygonum aviculare is actually good for recovering from diarrhea. 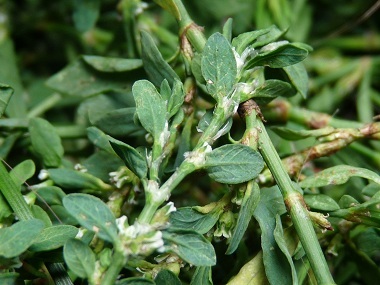 Common Knotgrass is related to buckwheat and dock. This hardy plant is drought resistant as it has a single taproot that can penetrate into the ground up to 45 centimetres. Distinguishing Features: Common knotgrass has spreading stems that can reach up to one metre long that stay low to the ground. It is most often recognized as appearing in a somewhat of a spinally-circular growth that has small leaves and tiny white flowers. 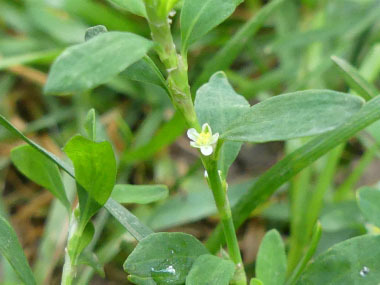 Flowers: Common knotgrass begins flowering in May and depending on conditions, continues to flower into October. Cleistogamic flowers (which do not open, therefore self-pollination is necessarily) are found under the ochrea. Flowers are small, pink or greenish-white and often appear in groups of 2-5 in the axils. Fields of Nutrition has medicinal benefits and vitamin/mineral content of Knotgrass. Leaves: Elliptical to linear in shape, the leaves are pinnate-nerved and hardly petiolate, emerging from a thin, membranous, stem. 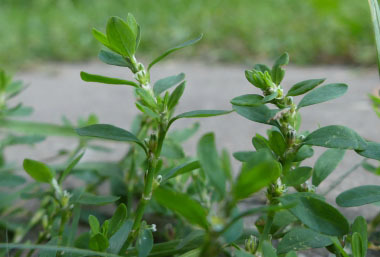 Height: Common knotgrass (Polygonum aviculare) does not grow in height; it grows along the ground. 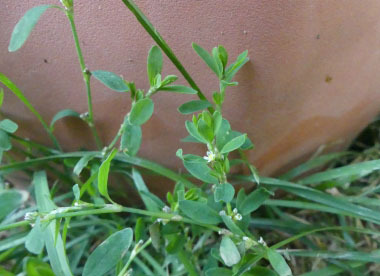 Habitat: Common knotgrass can be found in fields and in disturbed soils of waste areas. It also tends to grow along side of driveways and through the cracks of patio stones. It prefers sandy, gravelly, or rocky coastal areas, as well as grasslands. Edible parts: Aerial parts are gathered in the summer and can be added to salads, soups, or other dishes. Common knotgrass can also be dried and stored. Similar plants: Spotted knotweed, Common smartweed.